The Lake District is known for its dramatic, mountainous landscapes. 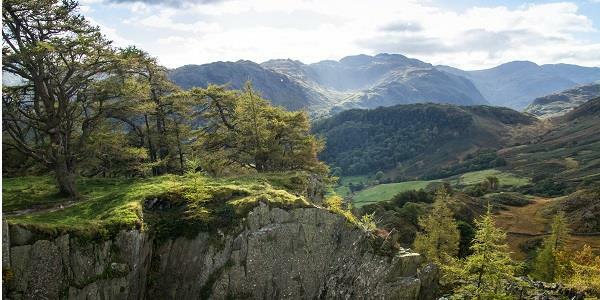 Walkers from all over the world visit this famous park with the aim of tackling its many peaks, from the lofty heights of Scafell Pike to the gentle slopes of Grasmere. If you’re planning a stay at our charming Braithwaite Court property, just outside the village of Keswick, there’s no reason to miss out. You’ll find plenty of routes to keep you busy, including some breathtaking mountain trails. However, if you’re a newcomer to the lakes, or just to mountains in general, we know that those towering slopes might be a little daunting. 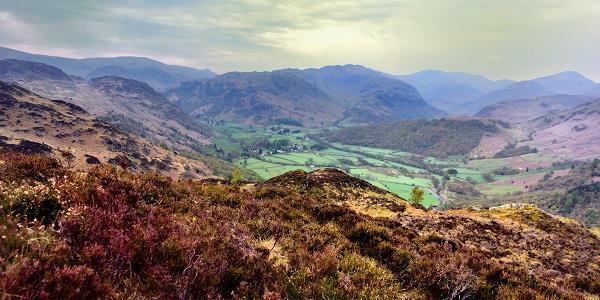 To make things easier, we’ve put together a list of 5 mountain walks that are suitable for beginners, or just those who are after a gentler excursion. To make things even better, they’re all less than 20 minutes’ drive from Braithwaite Court! Catbells is one of the most famous walks in the Lake District, and is just 15 minutes’ drive from the comfort of Braithwaite Court. Walkers can either drive to the base and park in one of the many lay-bys, or if you want to extend your adventure you can start and finish with the 2.5 mile walk from Keswick. Catbells may be a short walk, but it is sharp. There’s a short steep section on the way up which requires a minor bit of scrambling, but apart from this is a relatively easy climb. And all the effort is worth it once you reach the spectacular views at the top, which span over Keswick, Derwentwater and Borrowdale. The Catbells walk is a great one to enjoy at a gentle pace on a clear, sunny day, but is also a bracing climb for a summer evening or afternoon. The popularity of Catbells means you’re likely to meet other walkers along the 4-mile route. It typically takes around 2 to 3 hours, and it’s recommended that walkers follow the route clockwise. This is because the scrambly bits are easier on the way up, while the steps off the ridge are a quicker and easier route back down. At around 4 miles long, it should take around 3 hours to complete the Castle Crag walk. Starting at Grange, just over 15 minutes from Braithwaite, you’ll quickly find yourself amongst the Lake District’s famous volcanic rocks. The slopes and geological features you’ll see during this walk were sculpted by glaciers around 8,000 years ago. Once you reach the top of this steep but gradual climb, you’ll discover the site of a hill fort, which stood on this spot 2,000 years ago and took advantage of the spectacular scenery. As well as the stunning views of the valley bed, you’ll be able to spot Peace How and a war memorial during your walk. Another highlight to look out for are the beautiful colours in the rock walls of Dalt Quarry, which has developed into a wetland habitat since closing. In fact, this walk was described by the famous author Alfred Wainwright as ‘the finest square mile in Lakeland’! High praise indeed! It’s a short drive from Keswick, but this delightful circular walk is perfect for a morning or afternoon in the fresh air. At 5 miles long, it’s a little longer than the other walks on this list (around 3 hours), but it takes you through oak woodland, mountain tarns and the quaint hamlet of Watendlath. Just under 20 minutes from Braithwaite, it’s well worth a trip. The route follows good paths to start with, although also includes one very steep ascent. The ground before Watendlath can also be very wet. Early on the walk, you’ll find the ‘Six Sisters’ – a group of trees made up of five Scots Pines and a Yew. From here you can take a moment to enjoy one of the best panoramas in the Lake District. And this is just the start - you’ll startle upon some breathtaking viewpoints throughout the walk, including the beautiful Dock Tarn. Directly North of Keswick, you’ll find Latrigg - Keswick’s own fell with beautiful views over the town, Derwentwater and the surrounding fells. 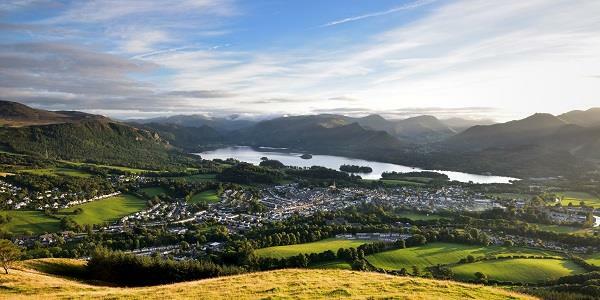 It’s an easy route up and down from Keswick, with a circular path around the summit. 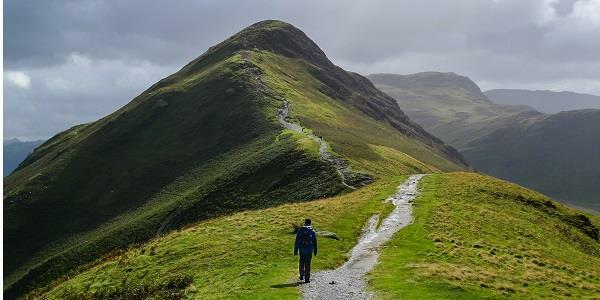 The shortest version of the Latrigg walk is approximately 3 miles long, and should take between 2 to 2.5 hours, but there are a few variations– including some which take in the old Keswick Railway Route, built in 1864. All are ideal for a quick walk with great views, and a great way to spend a sunny afternoon. For those who don’t wish to walk the whole route, there’s a small car park above Applethwaite, with a limited mobility path to the viewpoint. This car park does tend to get quite busy with dog walkers and those heading for nearby Skiddaw, so time your visit carefully in order to get a good spot. At 6 miles long, Castlerigg Fell is both the highest and longest walk on the list. It’s a distinct fell about 10 minutes from Braithwaite Court, taking in some of the best-known sights in the region such as Ashness Bridge and some spectacular views over Derwentwater. 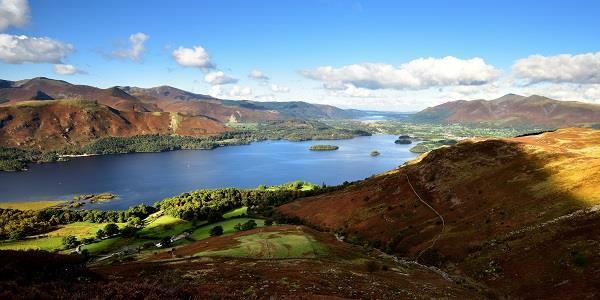 This route also takes in Walla Crag, named after the Countess of Derwentwater who, according to the story, used the gully to escape after the arrest of her husband during the Jacobite Uprising of 1715. This is a longer walk with plenty of opportunities to rest and drink in the beauty of your surroundings. However, if you’re really looking to push yourself, you could extend the walk and take on another peak by scaling High Seat. This will stretch the route by 4km and take you up to 608m, but will reward you with some of the best views of the local area. Just don’t forget your camera! The Lake District is rich with fantastic views and landscapes to enjoy, and this is just the start. Once you get your first few mountains under your belt, we’re sure you’ll find yourself itching to take on higher and higher peaks! For more information on each of these routes, including maps and directions, visit the WalkLakes website. Of course, if climbing isn’t for you, there’s also plenty of flatter walks to enjoy around the National Park. The great thing about the Lake District is that there’s truly something for everyone. Whatever you decide to do during your days, there’s nothing quite like returning to your own comfortable holiday accommodation for a hot bath or shower, then sitting back and reliving your adventure with a glass of wine. Braithwaite Court is the ideal retreat, with 32 apartments and cottages perfect for resting your tired feet. To find out more about staying at Braithwaite Court, as well as our many other properties throughout the UK and Europe, just get in touch with our expert team.